In the market, mobile phone concept fun really is nothing new. Some vendors even with the most overt coupled to animated characters that middle groove. This is the right strategy to attract consumers. IMO as see one of the potential rift that just been to, and IMO was born G100. Basic form of this phone is a candybar, a typical cirri of phone China. 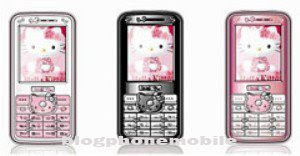 Interestingly cashing phone decorated glossy cartoon-like Hello Kitty. In fact, the model D-pad with the G100 clearly show the face of the cat is funny. Because the real Dual On technology, IMO G100 prepare for a special two-button dialing to use two different cards. Button Left Soft Key is used to dial the second card. While the button call a cat a green image, for the first card. IMO G100 using depth touch screen TFT 262,144 color, with resolution QCIF (176 x 144 pixels). For 2.2 inch diagonal screen, but with the effect of brightness and contrast of fit, able to show clear screen. To open the menu IMO G100 menu list with the small icons at the top. Problems arise when we open a sub-menu, looks very standard. Only text decorated with graphic icons. Beautify the look of the display business, IMO G100 seemed minimal. Only provide the wallpaper, also with a limited selection. The presence of two SIM card slot behind the battery, a main point and most excellent. Moreover, can be run simultaneously (Dual On), the card is inserted the operator is a GSM-GSM. Ability to identify the network operator already be regarded good. IMO also provides a special setting, if you want to use one of the SIM card you just simply go to the settings menu select enable and select the desired mode. But unfortunately for the reception of incoming phone, the SIM can not both receive the same, or even through menandakannya tone saddle. Existing phone number only to be spelled out are not active. Unfortunately yes. Entertainment facilities IMO G100 lumayan lengkap. There are MP3 player, media player, MPEG4 and 3gp. Two funnel ready loudspeaker jar your ears. Unfortunately, there is no application autoformat of memory card in the phone. As a second choice IMO G100 entertainment facilities have been set up with FM radio broadcast waves selectivity middling well, through a headset that also functions as an antenna. You can also make the radio as the alarm through the Autoplay feature of FM. With this feature, you can automatically turn on the radio, which is determined according to the time before. Seeing the only IMO G100 VGA camera only, with the ability to take pictures beresolusi maximum 640 x 480 pixels. Results jepretannya still decorated much noise. Exposure over even impressed. Camera IMO G100 also can use the withdrawal camcorder, to record important moments-moments. 3gp video file types, so-so quality, recording and seemed less lancer interrupted. Canals and the presence of GPRS WAP browser on the G100, a tolerable powerful Internet site. Only it looks less friendly when opening a browser, you will shown direct link to fill in the URL address of the site. For menu options you must clicking options, the new structure of the browser menu will appear. To connect IMO G100 mengandalakan Bluetooth and cable data, unfortunately, this does not support the Bluetooth A2DP profile the withdrawal other mobile multimedia. You can make the withdrawal IMO G100 mass storage, with mengkkoneksikan mini USB data cable to the PC. As pemask IMO G100 use power Lithium Ion battery with 1800 mAh. Would appear performance because the phone is not too wasteful of energy. In one of up to full, the battery IMO G100 afford survive up to 3 days. You phone a unique collection hobby, IMO G100 could be a good nomination. Cover design cat funny, beautiful and stylist. Moreover, this also use mobile phone technology with the current increase leaves the network on the GSM Dual-GSM, multimedia facilities and also a good connection. Software injections only typical Chinese still dominate the view of the interface a little phone. The menu structure is simple and features a multimedia interface seems pedestrian. However, with the cheap price, IMO G100 reasonable enough for you to choose.